Today Hagege says the quote still resonates with him. His art continues to change, which he considers natural and healthy." One thing that hasn`t changed, however, is his dedication to a life in art. "Early in my career I talked to artists I admired and tried to keep in touch with them for advice. I noticed that the artists who were successful had a commitment to their art and a great work ethic,” he says. No doubt Hagege’s work ethic and commitment have contributed to his success. 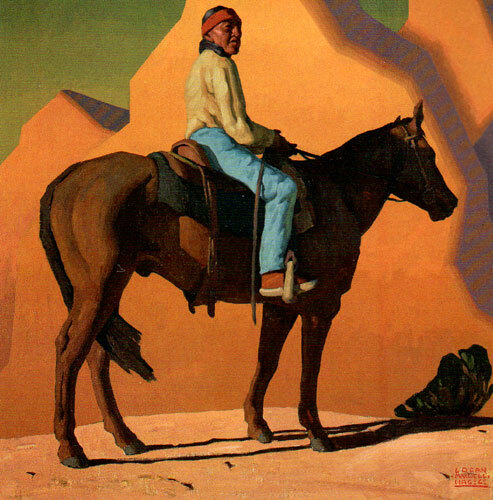 Today, at 31, he is often the youngest among the participants in shows like the Coors Western Art Exhibit and Sale, held annually in Denver, CO. At this year’s show he sold all four of his paintings, including one that went for $22,500. “I am really proud and feel very thankful that I get to do what I love,” Hagege says. Logan Maxwell Hagege, Skyline, oil, 30"x30"
How has your style or approach to your art changed since your first appearance in Southwest Art? "My style has evolved naturally over the years. In 2003 I was in the middle of a big change in my art. Just out of art school in 2001 I had started showing my work in galleries. This early work was fairly representational and conservatively painted, i felt unhappy with it, and so I took a two-month break from painting. Then I slowly started painting again— just creating compositions out of my head that consisted of stylized figures on the beach. This led me down a very valuable road. I left behind much of what I had been taught in art school and began the search to find my voice as an artist. That series of simplified women on the beach allowed me to push textures, different color palettes, and new compositional ideas. My style now has elements o f the more realistic vision that I had earlier in my career as well as my later discoveries. Some elements are realistic. Others are stylized or slightly abstracted." How has your subject matter changed? "My subject matter varies from American Indians to southwestern landscapes. I also paint northeastern fishermen and land­ scapes. I basically paint what inspires me. Usually inspiration comes from subjects that work with ideas I am trying out in the studio. For instance, southwestern landscapes can be really simple and geometric. So, if I’m in the mood to paint a simplified subject, I might choose a desert landscape. If I am trying to play with directional lines in composition, I might choose to paint a northeastern fishing scene. Keeping excited about what I paint is very important to me. I think my excitement always comes through in my successful paintings. When I look at master artists from the past, I often think it looks like they had fun painting a particular piece."